After much delay when almost all leading telecom operators have responded to the threat of Jio Prime with their own custom (segmented) offerings, BSNL is planning to counter Jio Prime. It will offer its subscribers 2 GB high-speed data/day along with unlimited voice calling at just Rs. 339. As reported by TelecomTalk, BSNL will announce some new plans offering unlimited data and voice along with revised tariff plans shortly. This will help BSNL counter similar plans offered by leading telcos in India at a much more competitive price. Note: We would advise our readers to take this news with a pinch of salt, as these plans are not yet officially revealed by BSNL, but are based on the sources of TelecomTalk. Back in December 2016, BSNL launched these plans with varying prices around various telecom circles. The Rs. 99 (varies from Rs. 99 to Rs. 149) plan offered unlimited local/national voice calling to any BSNL number along with 300 MB data, valid for 28 days. The other plan, costing Rs. 339 was also valid for 28 days but offered unlimited Local/STD calls to any number in the country along with 1 GB data. According to the report, these plans would be revised to offer greater data benefits. The Rs. 99 plan will be revised to offer 500 MB data, unlimited on-net calls across the country while carrying the same validity of 28 days. On the other hand, Rs. 339 will offer 2 GB data/day (FUP- 80 Kbps) bundled with unlimited voice calls to any number in India. As 2GB/day sounds too good to be true at Rs. 339, BSNL has planned something to cut its costs. In this plan, it will restrict off-net calling (BSNL to others) to just 25 minutes/day, post which the users will be charged at 25p/min. There will be no cap on on-net (BSNL-BSNL) calls. This is much less than what the other telcos are offering. Airtel, Vodafone, and Idea are restricting unlimited off-net calls to 300 mins/day or 1200 mins/week, whereas Jio is having no cap on the minutes of free voice calls that the users can make on any of its plans. 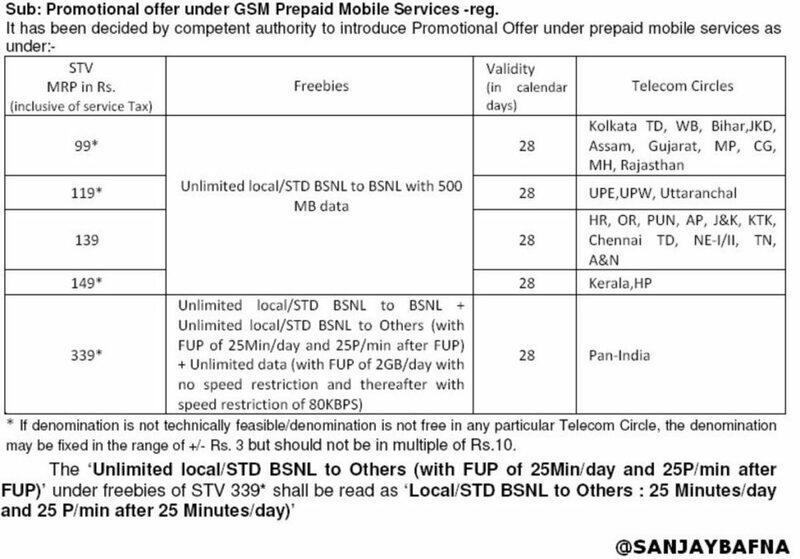 BSNL will launch these plans as ‘Promotional Offers’ valid for 90 days, post which the company reserves the right to modify them. These plans would be available in the next 2-3 days and would give the promo plans from the leading telecom operators, a run for their money. Besides offering a generous amount of data, the main advantage of these plans is the fact that you do not need to have a 4G smartphone for getting the best benefits. So, you can hold on to your old smartphone and still get 2 GB high-speed data/day. We will let you know when BSNL launches these plans. Stay tuned! "Jio Effect: Now, BSNL To Offer 2 GB/Day, Unlimited Calling @ Rs. 339! ", 2 out of 5 based on 9 ratings. Is this plan is launched by BSNL ? If yes, how to activate it ?